Steep iron ore prices quoted by state run miner Odisha Mining Corporation (OMC) in its e-auctions has left the steel makers in the lurch. The steel industry that is passing through a challenging phase and incurring losses due to cheaper imports from China and exorbitant ore prices in the domestic market, has called for correction in prices by OMC. While finished steel prices have slid by a quarter from Rs 36,000 to Rs 27,000 per tonne in six months, global iron prices have also plunged to $50 a tonne from the level of $120 a year back. Steel companies feel the downtrend in global prices should prompt OMC to cut its unacceptably high floor price amid its dwindling ore despatches. "In a falling market, OMC is piling up inventory by refusing to cut its auction floor price. We believe that floor price of lumps should fall by at least Rs 1,000 from the present price of Rs 2,600 a tonne. In the latest auction, OMC received bids for hardly 10 per cent of lumps whereas there were no bidders for fines. 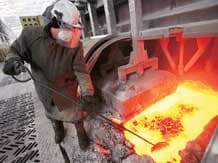 Amid glut in supplies by China and slump in global iron ore prices, no steel maker would be willing to pay the price quoted by OMC," said a senior official of a major steel company. "There is no logic or rationale in high floor prices of OMC. The miner can take a cue from Karnataka where the floor price is fixed at a rate equal to 50 per cent of the last bidding price," said he. At a meeting chaired by chief minister Naveen Patnaik in April, the government decided to reduce floor price during e-auction of iron ore by OMC to ease raw material supply to mineral based industries. Chief secretary G C Pati agreed that iron ore price escalated in the state as production fell 30 per cent in 2014-15 while price of imported ore actually fell in the same period. A month later, when the chief minister reviewed the status of large industries, the steel & mines department said, OMC has been gradually rationalising its floor prices. But OMC's auction price still continues to be prohibitive for buyers. OMC's managing director S N Girish was not available for his comments. Analysts feel market dynamics would force OMC to cut prices. "OMC is behaving in a similar way NMDC was operating three months back. However, market forces (sharp fall in iron ore volume) led NMDC to reduce iron ore prices in line with market prices. Normally, we have observed over past years that producers are reluctant to cut prices immediately after fall in international prices as they wait for prices to stabilise, however, as prices have stabilised at lower levels, OMC don't have any choice other than cutting iron ore prices," said Giriraj Daga, portfolio manager at SKS Capital & Research Pvt Ltd. The inventory of iron ore lumps and fines at Daitary, a major mine owned by OMC, has more than trebled from 57,641 tonne (in October 2014) to 171,473 tonne by the end of May this year. Rajdeep Mohanty, resident director, JSL said, "The government needs to revise the auction price formula of OMC in the interest of steel companies and ferrochrome makers who are losing money. The price discovery can be based on prevailing market prices of sponge iron, steel and ferrochrome." An industry source feels floor prices of iron fines auctioned by OMC needs to be pegged in the band of Rs 1,100-1,200 a tonne. "Pellet prices have crashed by 44 per cent in the past six months while prices of fines have not been corrected proportionately. Unrealistic floor prices will only shun buyers," he said. The last e-auction was done by OMC on July 9 for 120,000 tonne of iron ore lumps and 60,000 tonne of fines from its Daitari mines. The floor prices of iron ore lumps was fixed at Rs 2,600 a tonne while that of fines was pegged at Rs 1,700 per tonne.